LAFM TV 13th Season! Episode 19! February 13, 2019	Comments Off on LAFM TV 13th Season! Episode 19! We have a great show this week with special guests LSU Baseball Director of Player Development Micah Gibbs, Haynesville senior DT/LSU signee Joseph Evans, and DiGiulio Brothers Italian Cafe owner Mike Johnson! Click the link for more information! Check out today's prep team spotlight and recruiting update on the Union Parish Farmers! Today, we caught up with Teurlings Catholic Head Coach Dane Charpentier as he gives us his thoughts on what kind of player the LSU Tigers will be getting in Thomas Perry! LAFM TV Show! 13th Season! Episode 17 Now Available On YouTube! February 6, 2019	Comments Off on LAFM TV Show! 13th Season! Episode 17 Now Available On YouTube! Check out today's prep team spotlight and recruiting update on the Woodlawn (Shreveport) Knights! LAFM TV 13th Season! Episode 18! February 5, 2019	Comments Off on LAFM TV 13th Season! Episode 18! 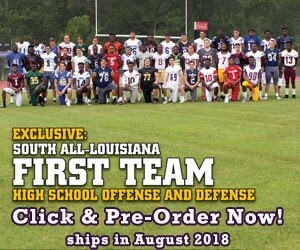 We have a great show this week with special guests Nicholls State Head Coach Tim Rebowe, Country Day Head Coach Joe Chango, Nicholls State junior defensive end Sully Laiche, Country Day junior quarterback Justin Ibieta, and so much more! Click the link for more information! Check out today's prep team spotlight and recruiting update on the Eleanor McMain Mustangs! Check out today's prep team spotlight and recruiting update on the Washington Marion Chargin' Indians! We caught up with some of the star senior players that will be talking about the past season as well as what schools they will be playing at the next level!